Step right up – it’s a carnival birthday party! 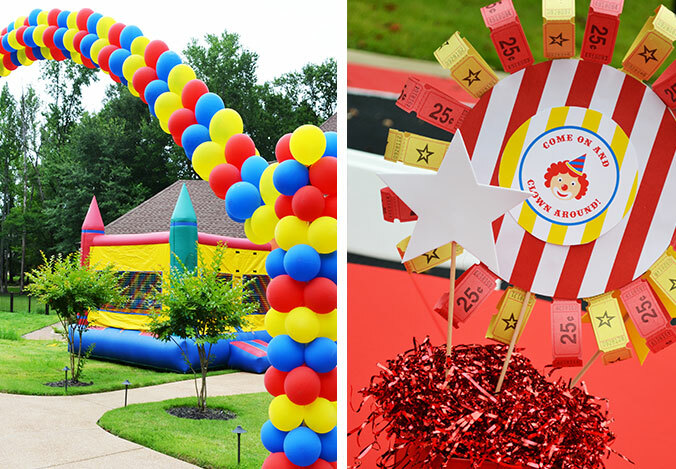 Boys and girls of all ages are sure to love this birthday party theme. 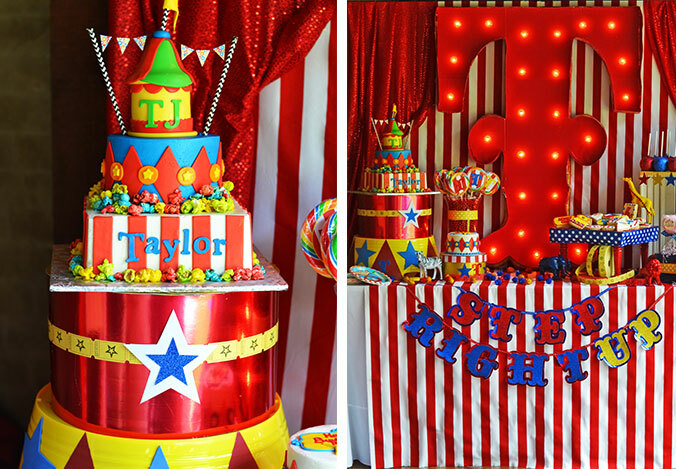 Brittany Schwaigert of Grey Grey Designs used our carnival birthday party supplies to style this party for a pair of birthday boys, TJ and Taylor, who were turning four and one. 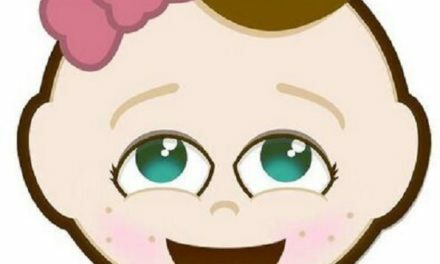 Check out her full blog post here, or keep on reading below for the highlights. All of our carnival party supplies feature cute illustrations of classic carnival games – from balloon darts on the napkins to ring toss on the plates, everything fits the carnival theme perfectly. The real star of the show, though, is the ticket booth. It’s super easy to assemble and stand up, and it makes the party look amazing! This adorable carnival cake was created by Mad Lily Cakery, and we love how Brittany displayed it on the table! Hat boxes with colorful wrapping paper and tickets make the perfect platform. 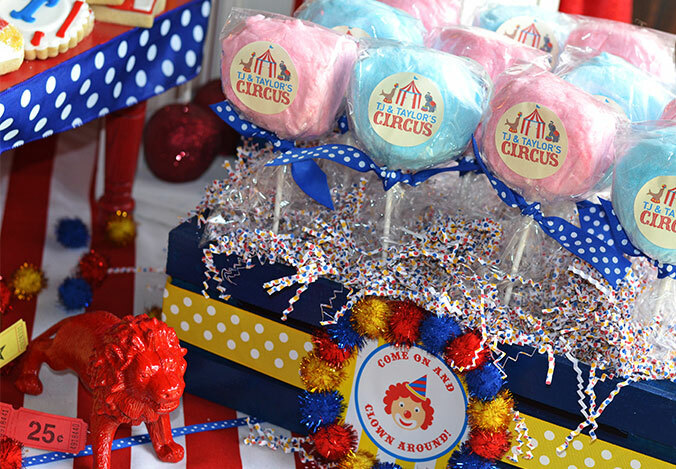 Circuses and carnivals are known for their signature snacks – cotton candy was a must for this party! Brittany dressed up some custom cotton candy pops from Dolly’s Sweet Dreams with bows of blue ribbon, and a fun wooden crate filled with shredded paper. Are these not the cutest animal cookies you’ve ever seen? Thanks go to Whimsy Cookie Co. for providing for the party. 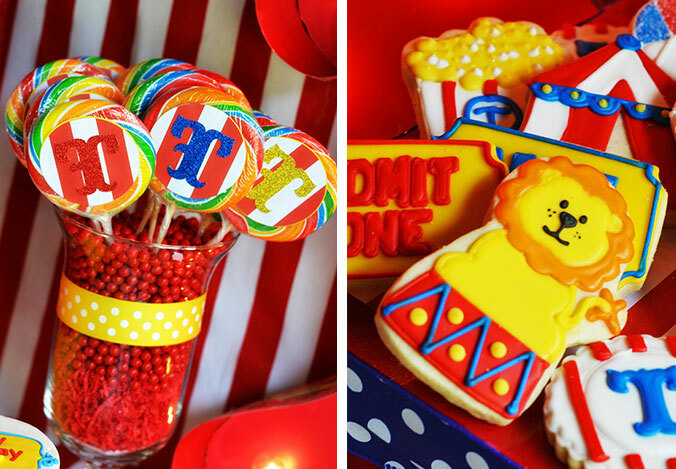 Clear glass vases or apothecary jars filled with candy always make a great way to display lollipops or any sweets with sticks, but Brittany went even further by decorating each individual Whirly Pop with cutouts of the birthday boys’ initials. Thanks to Autumn Lynn for these glittery candy apples. The photo doesn’t show off how gorgeous they are in person. According to Brittany, parents were calling up to make sure that yes, they were in fact edible – but almost too pretty to eat! The amazing outdoor balloon arch outside the party was crafted by Teddy Bear Express. It definitely got everyone in the mood for a carnival! Also, is that a bouncy castle in the background? Best birthday ever! Homemade Goldfish in a Bag Soap makes the perfect party favors for circus and carnival parties – guests going home with live fish is a little impractical, but this achieves the same look! 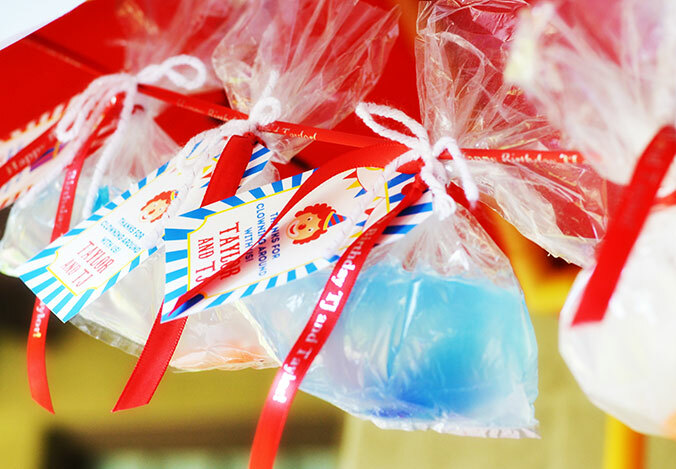 With plastic fish toys and red ribbons, the bags matched the party theme beautifully. Did you love carnivals and circuses when you were a kid, too? 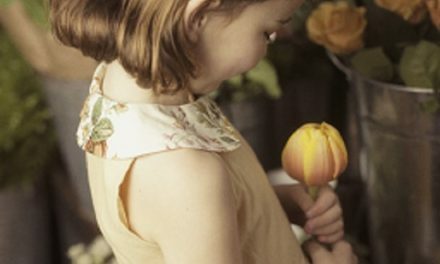 Have you been inspired with ideas for your child’s next birthday? What birthday party theme should we come up with next? 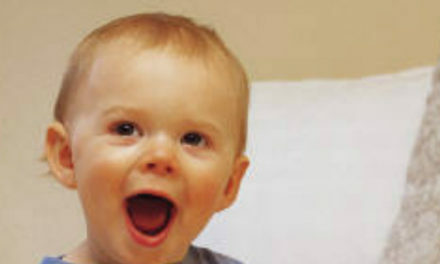 Share your thoughts with us on Facebook and Twitter @BirthdayExpress! Check out our Pinterest boards for even more party ideas, too. 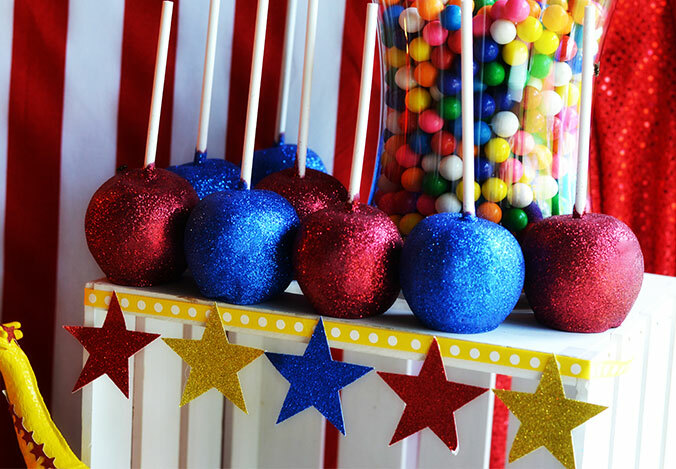 Click here to view the complete collection of Carnival Birthday Party Supplies on Birthday Express. Elijah Marsh: The human condition and mourning the loss of empathy.